I am excited to announce that the 4 months of painstaking hand sculpting is finally over and the much anticipated Inamorata 3.0 prototype is done ( and safely arrived to the caster). There have been a lot of questions about the new body so I wanted to write an article answering the most frequent ones from Instagram and Facebook. Hopefully we can start the preorders in May. I have sent prototype to the caster and will announce preorders open when I have an accepted sample in my hands. The blank dolls with one pair of hands and feet will be 900usd. I haven’t got the price info for the extra feet and hands yet. The new generation Inamorata 3.0 has more torso and neck joints, shoulders and hips with enhanced mobility, new pairs of optional feet and hands, resculpted nape of the neck and insertable eyes. In addition to all this new expression there is more sculptural detail and the body has more athletic look. Ready made insertable eyes so you can change eye colour and direction of the gaze. 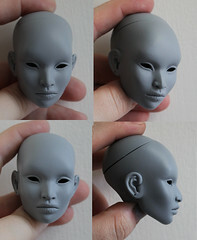 Insertable eye base so you can make your own. 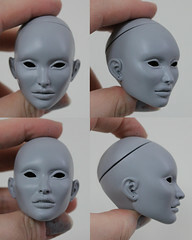 Filler eyes that can be glued in and painted for traditional look. Yes, the old high heeled feet are still available, though improved, and fit most 16″ doll shoes. The new ballet feet and flats are optional, can be bought separately and come with their own shoes. 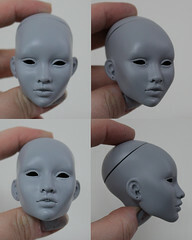 If you want to order a resin shade matching an older doll you should do so in the preorder stage as not all skin tones will be stocked. Refreshed high heeled feet in a size that makes sharing shoes easy. I added more detail to show the strain of wearing that classic 6 inch stiletto heels. New ballet feet (with their own pointe shoes) showing all the painstaking hard work that goes into the art of ballet. I loved sculpting all the wrinkles in the soles of the feet! New flat feet (with their own shoes too) for more relaxed Audrey Hepburn elegance. I purposefully made these in a size that fits most action figure shoes in case your doll wants to be sporty in sneakers or combat boots! Yes you can. There is a completely new pair of ballet hand sculpts, 3 other new hands sculpts, and 3 updated old favourites. All the pairs will be available to be bought separately. Like with feet, you should order at the preorder stage to make sure you get a resin tone matching your older dolls as not all colours will be stocked. Unfortunately my home business is too small to carry large stock and having two molds open at the factory is too expensive. 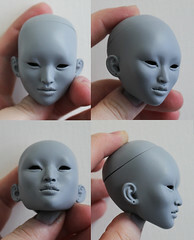 There are still few streamlined bodies left, so if you prefer that please contact me to reserve one ASAP. The old body will fit the new heads too if you want to mix and match. Please don’t hesitate to ask any questions. I will keep you posted with the progress! Here are some more pictures of the next generation for you to enjoy!